Days go by quickly in the blogging world, I was going to try to post every other day and I’ve skipped four! I’m pretty sure I was a zombie for most of those days, though, so that’s my lame excuse. For whatever reason, I do my best thesis writing between 8pm and 3am, so my sleep schedule has been out of whack for weeks now. However, in about 4-5 weeks, all of that should be over. Actually, when I say it like that, it doesn’t really sound so close. But it is. In happier news, I’ve started trying to design some wristwarmers! That’s just the cuff so far, knit in Sanguine Gryphon’s new worsted-weight merino/cashmere/nylong yarn, Zaftig, in the colorway Fierce Snake, which I’m kind of in love with. It’s this neat neutral tan color with shots of teal, green, pink, and magenta through it. This is definitely out of my typical color range but I love it. I really like the base, too, but at the price/yardage I can only afford to make 1-skein projects with it. In light of that, and figuring I can’t be the only one, I thought it would be neat to try to come up with a 1-skein design. When my power (and thus heat and water) were out for days during the October Snowpocalypse here in New England, I was wishing for some wrist or armwarmers. I have plenty of fingerless gloves, but I wanted some nice thick wristwarmers to keep the heat trapped in while still allowing my palms and fingers to be free to knit. 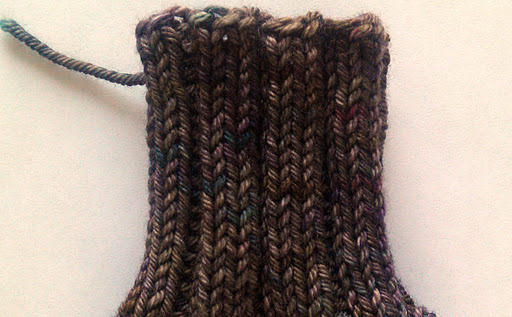 I can knit wearing fingerless gloves, but I don’t like it. Apparently I use my palms a lot for handling the needles and yarn, for feeling where things are, and the tips of my DPNs kept getting stuck in the fabric. I used to think “Armwarmers? Weird! What good are those? Just wear gloves!” but then I started to think about it and realized I could maybe use some. In addition to frozen knitting, they would come in handy in my office where I am constantly leaning my forearms on my ice-cold metal desk. So I’m giving it a shot. I can’t tell how many times I’ve tinked back already, though. I keep changing my mind about needle size and the numbers of stitches to cast on and the type of ribbing to do and how I want everything to line up in the end. These better be the prettiest wristwarmers in all the land when they are done! I’m excited about this color! I passed it by when it was updated but I’m glad I snagged a couple of skeins now. I think the complex teal/green/neutral combo will make a great garter-stitch heavy shawl, like Celaeno, which I’ve had queued for quite some time. I’m starting to compile a list of all the pretty things I want to cast on when my holiday knitting (which I’m already procrastinating about) is done. This entry was posted in Bugga, MyDesigns, yarnaholic by shoelaceswitcher. Bookmark the permalink. and then I had to give it all away! Yes, I've cancelled from shame before. 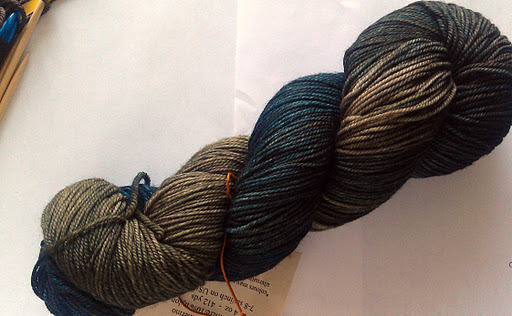 I bought Wollmeise on a whim at TLE and emailed right after my purchase to cancel because I was feeling guilty. I've never caught a WM update on TLE since 😦 I should've never cancelled……. @Mcknitgirl Aww! I haven't tried Wollmeise myself yet. I think the colors are so INTENSE, the hype is incredible.